Their Sorrows are REAL, show them your LOVE is too. 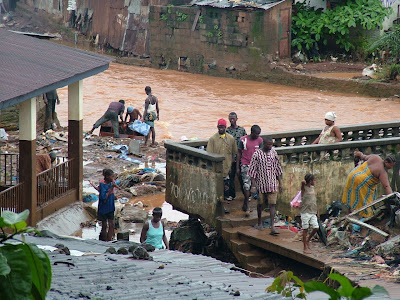 But it is the truth that in the event of any disaster here in Sierra Leone, it is the aged, the women and children who suffer the most. Tell me this is a lie and I will be there quick to give you the facts. 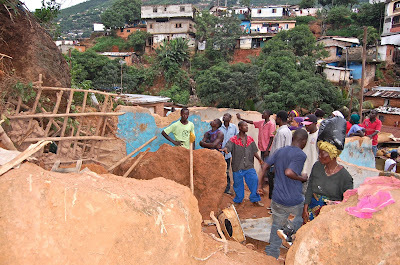 Pictures of our recent blog posts shows nothing but women and Children caught in middle of these sorrowful natural disasters (scroll back through past posts to review these stories). Had it been all well and beautiful for them , I guess they would rather choose a better place than living in these areas where hunger, flood, disease and death is a common language. But the world is not all beautiful, it is not all well, and not all of us get a chance to live free from the effects of severe poverty. 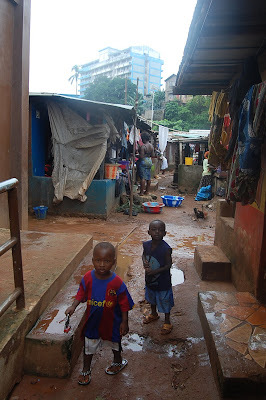 Looking around us here in Mama Salone, there is not a day that you wake up without seeing more and more kids lacking the basic needs a child requires as he or she grows up. Take it this way, early in the morning here; it is the child that does all the running around to see that all the family needs are met with or without the resources to make this happen. 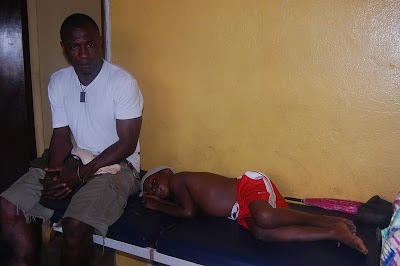 My questions are, why is it that it is the kids that suffer the most? It is the kids that are still naked; it is them that are still homeless and hungry. This brings me back to our biggest request for Nazareth House Apostolate, here in Sierra Leone. The need of a compound of our own where we can operate directly. A distribution Center to store and spread out the supplies, a lodging for your Nazareth House Staff - namely me and my family who are your arms and legs, enabling you to reach out first hand to the poor; a home where a whole lot can be feed and taken care of. A place where the homeless can seek refuge. 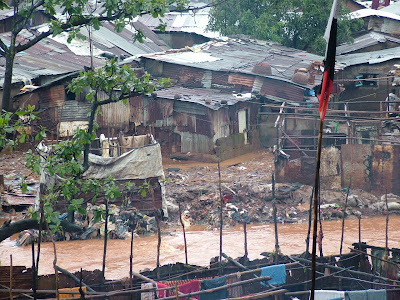 The compound is so desperately needed, so vitally important to the ongoing ministry to the poor. Soon it will be another year and fresh money will be needed to be paid for another year. Any time thought of this strikes my mind, fear looms in for I know how hard it is to raise all that money. 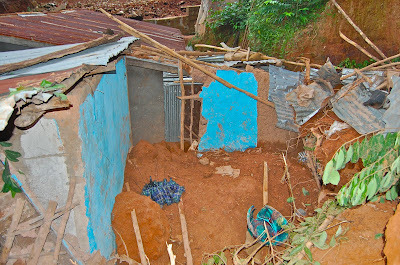 I must confess to you, all our precious blog readers and NHA sponsors that for the past few weeks, little has been said here about our continuous plea and desperate begging for our Mission Compound here in Freetown. Our own compound puts a stop to the continuous increase in our yearly rent in the present house we occupy. Nazareth House is small but growing. Yet in this smallness, a lot has been done. Hundreds and hundreds have benefited by your love and support. But we could do better, free of exaggerated rental fees and in our own place where more can be given to the poor and not landlords. I know Nazareth House is asking for serious money these days. We must, the needs are great. Sharing the opportunity to do the work that makes God smile is a gift you can give to your friends, people at your work, your church, your family members. We should not be greedy with the blessings from doing this work, it is something we should share with those we love so that they too can enjoy a blessing. Remember it is said "it is better to give than to receive". I have documented for you with my pictures and Mama Vicki always tells you with many words, of the desperate conditions here in Salone. You are well informed. Please do not look away and hope that it will be taken care of somehow. Take care of it and invite others to help you. We don't need millions and millions of monies as some organization do. We have no desire to be huge and overwhelmed with administrative thoughts and burdens. We just want to find those fallen into the cracks of life and be there for them. The more people we have giving $25 per month, the more opportunity we have to provide. Mama Vicki says that this, too, will give us a budget so that emergency beggings won't happen, we have it ready and waiting from the budget. I like that idea so much. 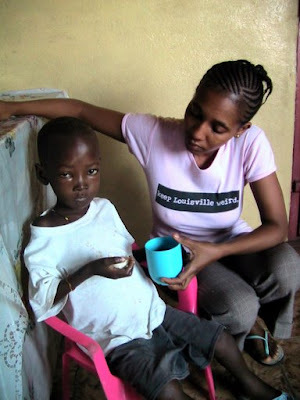 I cringe when I must call Mama Vicki and say "So and so needs surgery, can we raise the money?" And then she has to put the word out to you guys. I worry whether it will come or the patient die. It would be so fine to know that the money was already available. And we didn't have to wait the surgery for the money to come through. Thanks for reading my long words. I know your time is valuable. 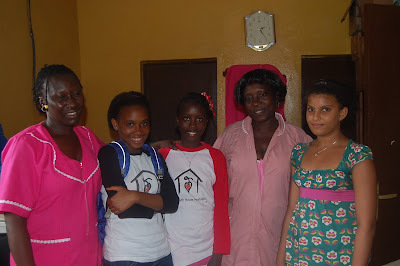 So are the lives you are saving through Nazareth House. God bless you. 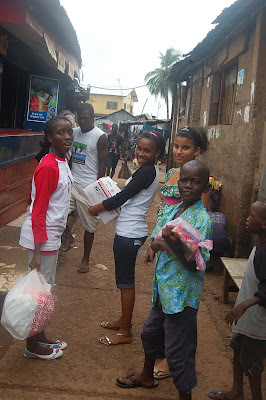 It’s still holiday here for all school-age students in Mama Salone (Sierra Leone). Soon it will be over and the struggle begins. The few lucky ones who were able to pay school fees find themselves in a make-shift shed learning their abc’s, dreaming of learning something that will improve their impoverished lives. Most fortunate are those who end up in a structure with effective teachers such as the one Nazareth House Apostolate provided in Kabala. Yet still poor parents find it very difficult to send all the kids to school for they can’t find the where-with-all needed to provide this for their children. In the end, most find themselves in the farm doing hard labour, majority of those living up Country thinks it is their way of life and this is how it should go for them. Others roam the streets either begging or selling stuffs to make a living. It is sad to say but it is a common thing here to see a girl of three tending to a baby sister all day long, hungry till the mother returns late in the evening from the farm. Sometimes you find it very difficult to comprehend just how hard it is for us over here. Especially when the desire is in our people to make a good life for our families but the possibilities of doing so are limited or the means are not there at all. It is with this kind of feeling that NHA took up the cause to help build a school to reduce the idle and helpless kids we meet everyday on the road side. Through Nazareth House, you changed the lives of so many children, you made education a reality and are equipping a whole lot at the Kabala Community. Now that is not all, these kids you see always carry a smile on the face but not all is well inside. They had been getting the bits and pieces of our usual supplies but their parents are looking up to NHA to help educate them. The Kabala school might be too far for them to go to but NHA can help provide them with the school fees and uniforms so that they can attend any of the nearby village schools. A few dollars out of your pockets might not buy much more than a few restaurant meals for you but given to Nazareth House it could change a whole life towards school fees, or even a whole month of food for a family. 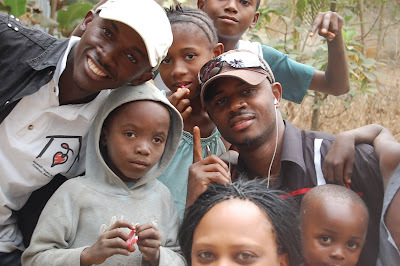 During our last trip to visit the NHA Kabala School, ROO had a great time dealing with the kids there and on the way to Freetown he had some fun time with Sorie at the one hut village only for him to ask before we leave that “ Papa, Where is Sorie’s school?”. 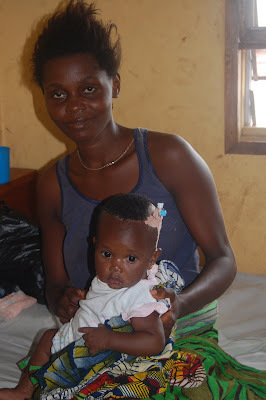 "I could only say, he can't afford to go to school, Roo, his papa has no money for school fees"
Soon you, our Nazareth House Supporters, will return to Sierra Leone, carried in the hearts of Papa Seraphim and Mama Vicki as they journey back to us. The work they do, the needs they provide are directly a result of your love and support. Every mouth fed, every medical need met, every hand held is as if you are doing it yourself. Remember as part of Nazareth House, we are all in this together. What I do, what mama does what you do - it is as one body doing it. Doing it in the name of God, loving our fellow human beings. 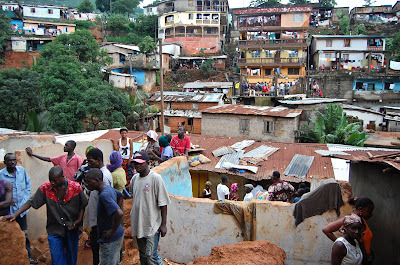 This trip you are making back to Salone through Nazareth House is so important. We need to prepare it well. 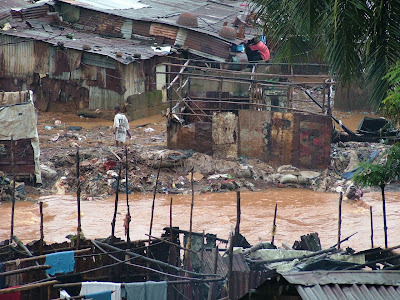 We need you to get out and talk to all your peoples, raise funds as much as possible so that this mission can provide all the necessary aids to the people of Sierra Leone. Hear their cries, we can't fix it all and end all their woes. But one at a time, we can reach so many. The time is now. We need you more than ever to provide for this mission. 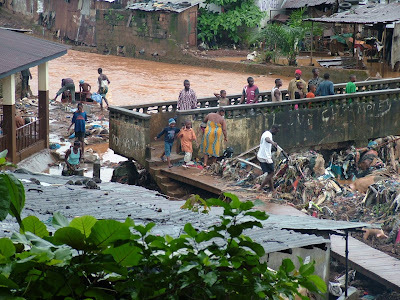 As the economy drops down the needs increase in Sierra Leone. We are hoping to collect $8,000 before October 15th, 2009. This money will provide on the ground aid as we travel through Sierra Leone from Freetown to Kabala assessing the needs and ministering to the people. Yesterday when I reported to you the conditions at Kroo Bay; it was much better. The water was low and less of a stress for its inhabitants. 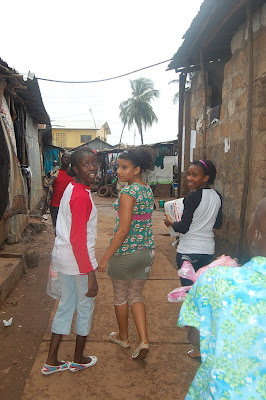 I was there, with my daughters and their friend to drop off a handful of medication to the small clinic down there. You never never know what this place is like till you step your feet on its soil. It was my dream for the rains to slow down a little but the Season and month of August continues to make its mark. 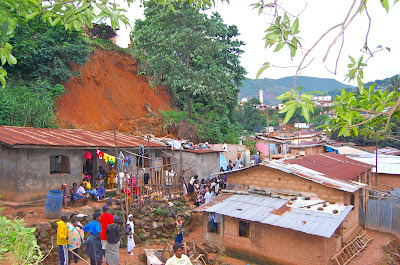 My last blog post mention about this forgotten community, Kroo Bay which is a part of the famous Freetown we all know and hear about. Hardly will I scoop this off my mind that a place like this, full of struggles and neglect, continues to exist in this day and time. 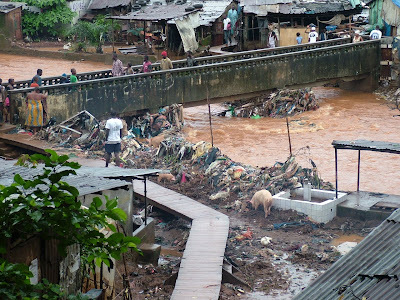 Even in the midst of all the poverty in Sierra Leone, Kroo Bay has more than its rightful share of tragedy. With these pictures, you can tell what I mean and you will see the great need here. It’s only a greedy, uncaring mind that will ignore my plea for these unfortunate people. From my experience this afternoon, after the seven hours continuous rainfall, Kroobay is in more troubles than what I reported yesterday on my last blog post. 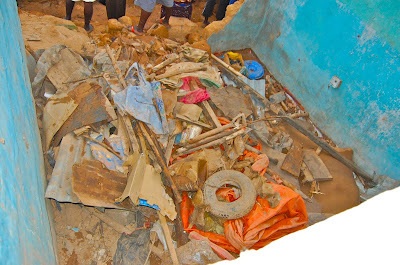 Now, it’s not only about fixing the leaking roof, neither is just about manually bailing the waters out of the rooms, these people were busy searching for their belongings, and hoping to find treasures. Consider it odd searching for something where there is nothing. The waters got so high that dozens of hungry, locally raised pigs were carried away into the ocean. The search continues not only for these hungry creatures but also for stuffs that might be of good use from one man to the other. This is life in Kroo Bay! Typically day by day, whatever resources you have are stripped away in the wink of an eye and you search for something that might come along to help you exist. You exist day to day, and hope is stashed away deep within you, you really don't see any signs of betterment for these inhabitants. With the passing of each day, they are neglected, forgotten by those who have the means to help them. 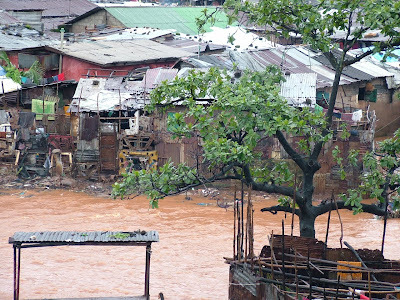 As these people's plight is pushed out of our memory, the death toll at Kroo Bay rises. A better life for them is an thought sitting on a shelf. 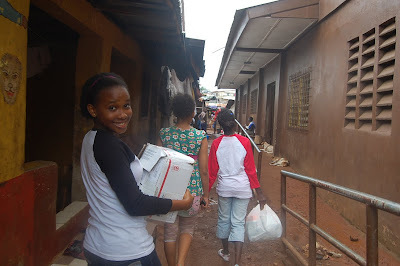 But you know a few dollars given in the helpful hands of Nazareth House Apostolate could go a long way. It may not save all of the lives (although we will try) but for sure we can save one life, one person at a time. Join with us, be a part of this Nazareth House way. Give today. Report from James Mansaray: Freetown, Sierra Leone. A single phone call from me to Nurse Adama, who works at Kroobay Clinic was just enough to create a whole scene of happiness for them with the hope of receiving more medication from NHA. At this time when the need is so great and nothing is little in the eyes of this hard working team. 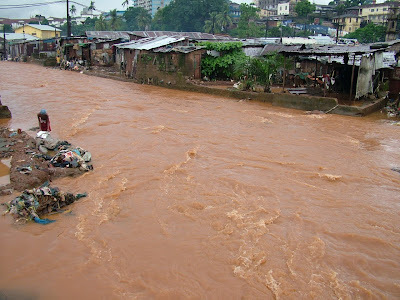 They need everything they can get so that they can tend to the desperate and water bound people of the Kroo Bay Community. that made up this caring team to help ease the great needs of this community. Lillian, who was just visiting with Lucy and Ann Marie, thought it fitting to help out for the first time. Her looks became a bit sad, after seeing what the reality of what Kroo Bay is like. In fact she took the place of Mama Vicki as she was called “ Orpoto” everywhere by the kids meaning "White Man" (woman). It might be a handful but whatever little we give to these people, it is put to use immediately. 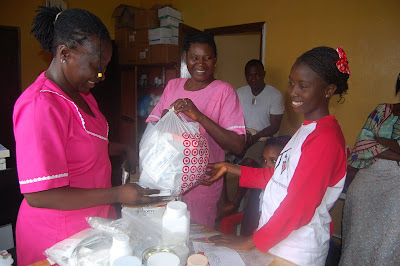 I was filled with happiness to learn from Nurse Adama that the bags full of medication Mama Vicki gave couple of months back was a great help and big relief to this medical team when this whole community was covered with water about a year ago. The fact was, we were turning our helping hands one direction to another part of town when this small clinic at Kroo Bay was noticed by Fr. Hicks. Here the needs are great and here NHA is needed so much if we could all come together and help in our own little way. 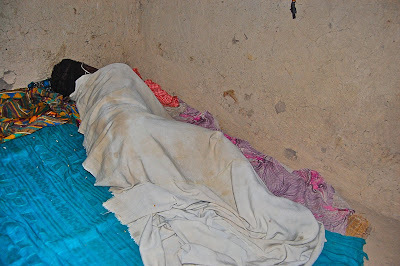 Consider yourself in the midst of a wet mattress or a cold blanket, a situation where there is no option, a place where the sound of a rain fall brings fear... meaning a bucket in the hand all night to save your feet....... and this is everyday life. Scenes of seriously ill kids waiting for help in a place where the supplies are little, in a world where everything meant money with nothing at hand. Men and women crowded in the same ward with different medical cases, making it a possibility for the spreading of more diseases. 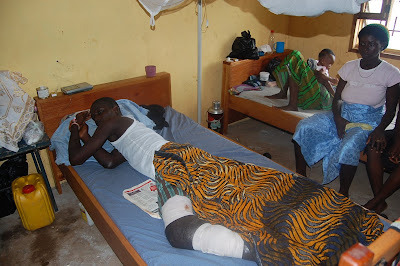 According to the other Nurse I spoke to, there is not a day when a severe diarrhea or malaria case will not be reported. And now with the rains pouring down every day in a place like this, things are getting . 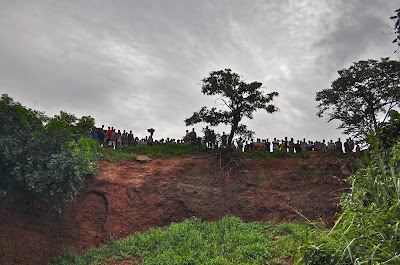 We can not sit and wait to hear more deaths as happened at Kissy Brooks few days ago? 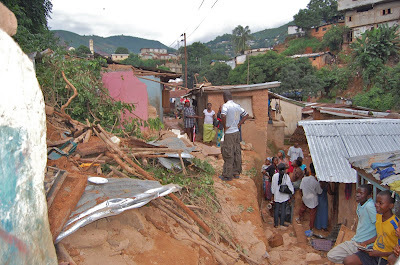 Not when Nazareth House has the people on the ground and ability to help these people. We only need the funding to make it happen. Send your donations to NHA so that an IV could be bought at least to save one life before it’s too late. 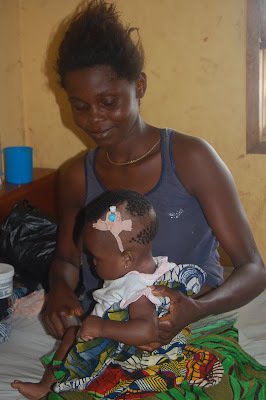 Mama Vicki has medical supply enough for Kroo Bay Clinic but must transport it to Sierra Leone. We cannot trust post office for these precious items, she must bring it in herself. It is important during this time, that she and Fr. 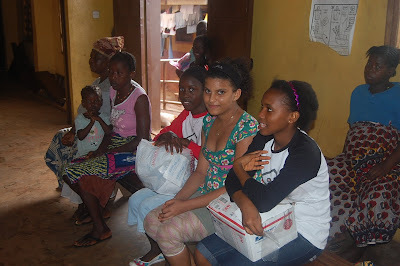 Seraphim are here, to give out the needed supply, to help us out, to work with the doctors, nurses and people in need. Help us raise the funds to make this trip a reality. Thank you. 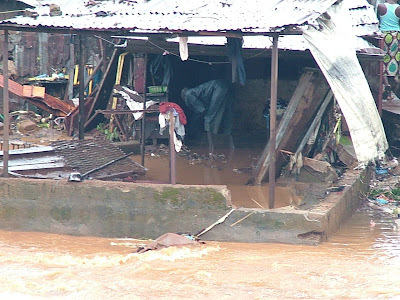 caused by the heavy rains that Sierra Leone is experiencing at this time. In pondering a way to describe this story, our chat itself seemed to define it best so I decided to simply share it with you. 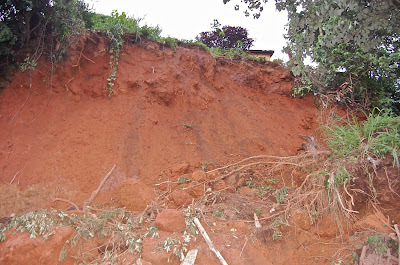 Sprinkled within the chat are the actual photos of the landslide taken my James. 3:50 PM Vicki:photoman, how you day? You ok? your pics are arriving in my email. the person laying down, who is it? 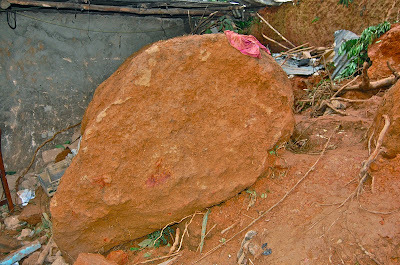 3:51 PM James: an injured girl, hurt by the rock slide in Kissy Brook others died, she lucky to survive. I tried to talk to a man who lost his 5 yr old daughter but he was just crying and could not talk. I wanted to find way to help him, to see what his needs were. poor guy. This breaks my heart. 3:57 PM Vicki: I will make sure this is said on blog... anything else? all we can do is make people aware of the needs and hope for the best. 3:58 PM James: lets help them out. My heart is so heavy for these people, mama. 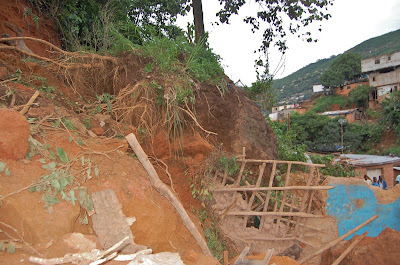 Donations can be sent to Nazareth House Apostolate, 2216 Goldsmith Lane, Louisville, KY 40218 (funds specifically for Kissy Brook Landslide victims should be noted as such) or paid via paypal on our website link.